The toughest sections of the off-road course south of Berlin really highlight the familiar strengths of the legendary short-nosed Unimog: its outstanding handling characteristics in difficult terrain. In the new generation, these have been improved even further, thanks to the altered position of the engine. 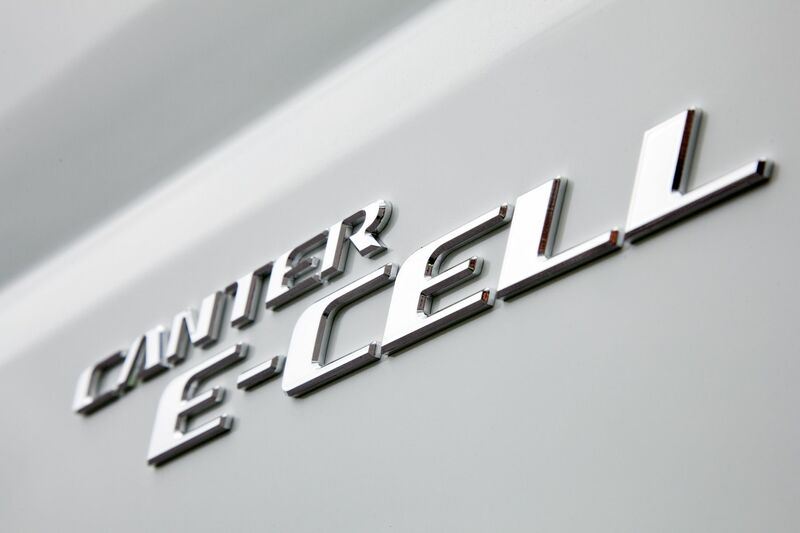 In 2013, Mercedes-Benz introduced diesel engines for the entire commercial vehicle range which conformed to the Euro VI emissions standard well ahead of the norm coming into enforcement. At the same time, the extreme off-road version of the Unimog also underwent a complete redevelopment to feature a mid-engine design. The engine has been shifted a metre to the rear, which helps not only accommodate the assemblies that Euro VI made necessary, but also enables direct power take-off from the engine. 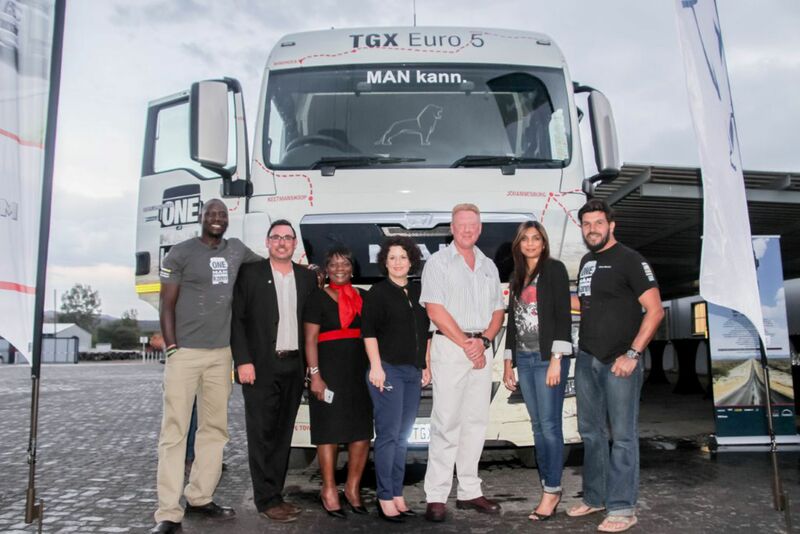 This means that devices can work independently of the vehicle being driven. Transmission power take-off also remains possible. The Euro VI diesel engine is the heart of the new mid-engine concept. The engine used here is the new high-torque OM 934 BlueTec 6 engine; a four-cylinder unit with an output of 170 kW (231 hp) and a displacement of 5.1 l. Exceptionally efficient, the assembly provides a higher torque of 900 Nm, which is available consistently over the entirety of the principal driving range from 1200 rpm to 1600 rpm. The technical top speed of 90 km/h is quite adequate for longer journeys and motorway driving. Despite the added engineering complexity required to meet the Euro VI criteria, the new all-terrain Unimog combines low fuel consumption with reduced emissions, great reliability, a long life expectancy and long maintenance intervals. Alongside cooled exhaust gas recirculation within the engine, emission control features a successively switched system comprising a closed particulate filter, AdBlue injection and an SCR catalytic converter. A particularly positive aspect: for the new Unimog with Euro VI engines, fuel consumption has been reduced by up to three percent. 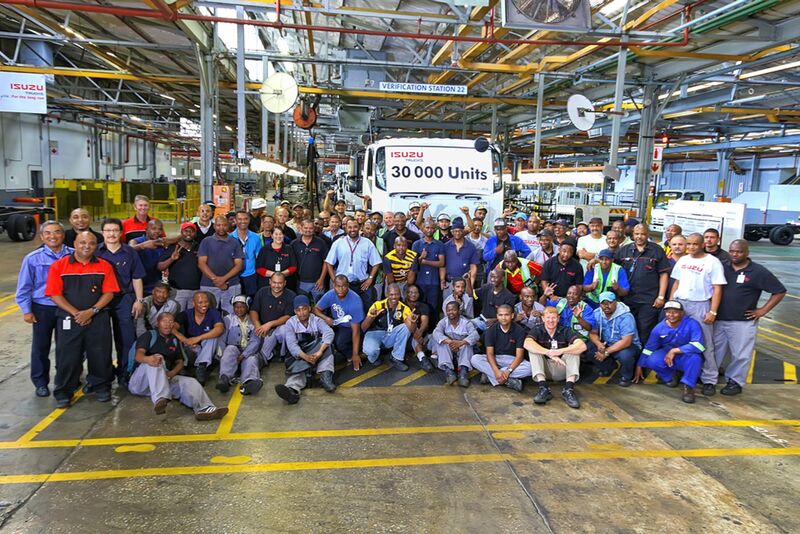 This means that the engines, which already produce up to 90 percent less emissions and particulate matter than the previous models, are even more environmentally friendly. The transmission of the Unimog has been optimised and uprated, resulting in shorter shift times whilst also extending its service life. The transmission is operated via a steering-column lever, which is also used to control the electronic quick reverse (EQR) function. As in the previous version, eight forward and six reverse gears are available and there is also an optional off-road group for off-road use in the speed range between 2.5 and 35 km/h. Safety has also been improved: the new engine brake is a double-speed decompression brake which, in the case of the OM 934, develops braking power of up to 180 kW. Each cylinder in the engine has its own engine brake unit. The high braking efficiency considerably reduces wear and tear on the wheel brake systems, thus greatly improving the overall economy. Offroad ABS comes as standard. As with all Mercedes-Benz commercial vehicles, the new model designations of the big Unimog include the horse power number: 230 in this case. The first two digits of the designation stand for the vehicle type. The biggest differences between the two models come in the form of the axles and frames, which thus affect the axle loads and gross vehicle weight. In the case of the U 4023, this is a maximum of 10.3 t, for the U 5023 a maximum of 14.5 t.
This cab is a classic – it has been instrumental in defining the appearance of the Unimog since 1974 – today it shapes the appearance of the Unimog extreme off-roader. The standard-production version of the cab is now 120 mm longer than its predecessor and it is also slightly higher. Together with the relocation of the transmission controls from the centre console to the steering-column lever, this results in substantially more generous space conditions inside the cab. Inside, the Unimog benefits from a new range of equipment including a multifunction steering wheel, adjustable steering column, steering-column lever, multifunction buttons, instrument cluster with a large display, and an upgraded heating and ventilation system, all of which create optimum conditions for the driver. The changed position of many controls in the overhead console makes it much easier to move across from the driver’s to the co-driver’s seat. Also, the seat position in the low-vibration area behind the front axle together with the new cab mounting concept make for comfortable driving, particularly off-road. All in all, the driver and passengers can enjoy real truck comfort in the new Unimog, which is not something to be taken for granted in a specialist vehicle of this type. The Tirecontrol plus tyre pressure control system has been completely redesigned. The preconfigured tyre pressure for the type of deployment can now be set simply and conveniently on the display by selecting the appropriate programmes. “Road”, “Sand” and “Rough Terrain” modes are preset. On the outside, the dynamically designed radiator grille and the new bumpers featuring state-of-the-art lights clearly indicate that a new Unimog generation is in operation here. The lamps not only look good, they also provide better vision, thanks to a broader light cone, increased range and daytime running lamps. If desired, a new camera monitoring system can also optimise all-round vision, particularly in the region directly in front of the vehicle – a particular plus, for example, when operating a winch or connecting front implements. The cab access concept has also been fully revised and the cab is now accessed safely and comfortably via two or three steps, depending on the customer’s requirements. 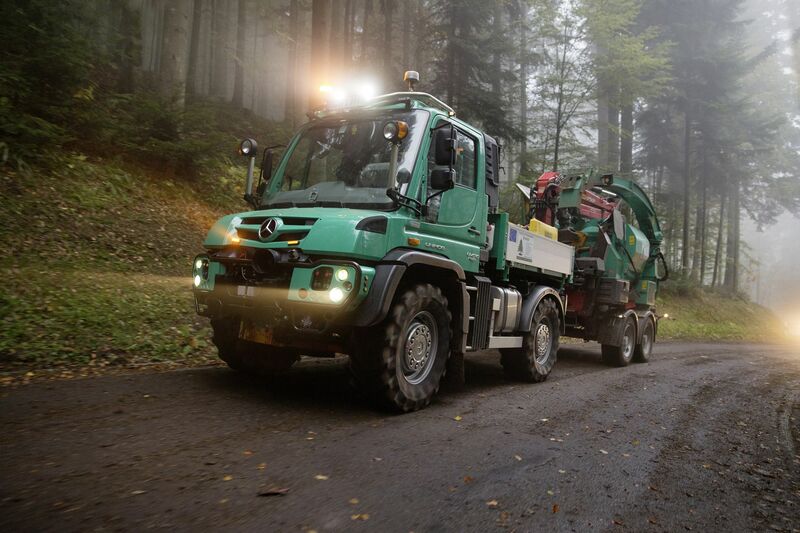 The Unimog cab can be tipped to simplify maintenance and repair tasks. In the new model series, the Unimog extreme off-roader remains available ex-factory with the characteristic crewcab which offers space for up to seven people. The great advantage of the Unimog extreme off-roader – its outstanding handling in heavy terrain – remains unimpaired. Indeed, in some respects its strengths have been further extended. The fact that the frame and the tubular cross-member of the Unimog is welded guarantees its exceptional robustness and torsional flexibility of up to 600 mm when driving off-road. 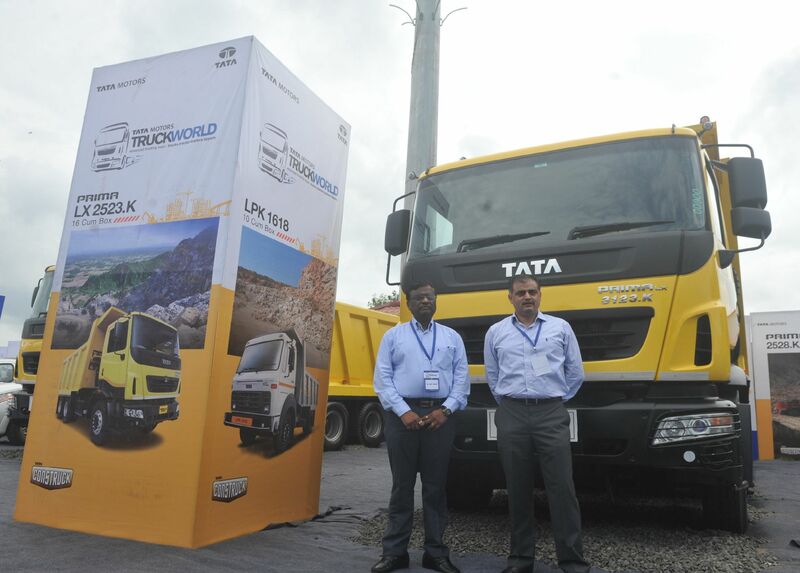 The axle articulation of up to 30 degrees is made possible by the use of torque tube technology in conjunction with coil springs, whereby the torque tube and the torque ball are used to connect the axles to the transmission. Portal axles, the low centre of gravity and extremely good angles of approach and departure (44 degrees at the front, 51 degrees at the rear), as well as the ramp angle (34 degrees) and its slope-climbing ability (45 degrees) all add up to make the Unimog extreme off-roader a true off-road professional. In addition to this there is the maximum fording depth of 1.20 m and a lateral inclination angle of up to 38 degrees. Driving in extreme situations with the all-wheel drive system engaged is supported by the selectable differential locks and the tyre pressure control system. Single tyres have always been part of the Unimog concept; the rear wheels follow precisely in the tracks of the front wheels and are thus able to take advantage of the firmer surface compacted by the front wheels. 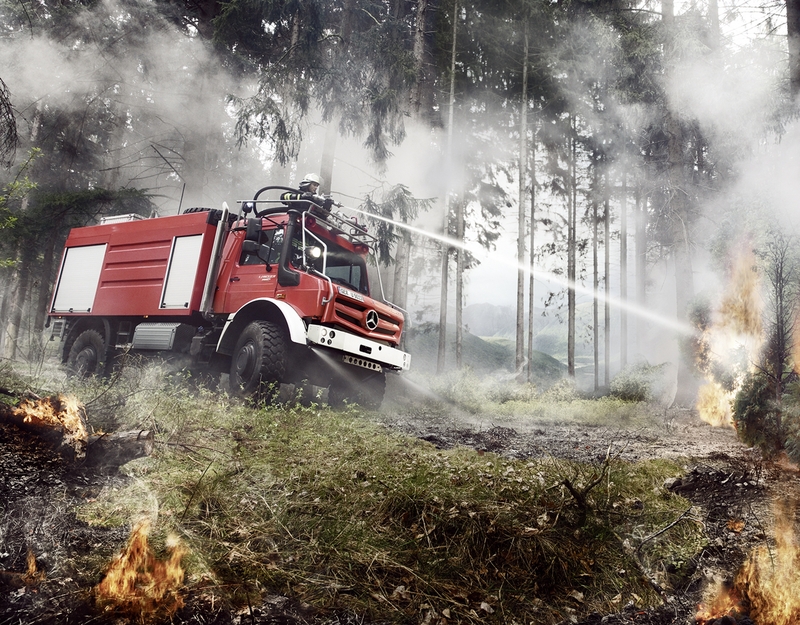 The Mercedes-Benz Unimog is a robust and reliable vehicle designed for a long service life. The completely welded frame and the encapsulated chassis components indicate that these vehicles are designed to cope with the highest levels of stress and strain. The axles are reinforced and all key assemblies are protected or are located in protected areas – and this is also true for the fording ability up to the guaranteed depth of 1.20 m. And if things get too hot in fire-fighting situations, the optionally available heat shielding provides appropriate protection. It protects all of the important lines, the AdBlue tank, catalytic converter, battery and the brake assemblies from high temperatures. All this explains why the Unimog extreme off-roader enjoys such an excellent reputation around the world. Off-road deployment in extreme conditions is the order of the day for these vehicles. For clearing heavy snow, fighting forest fires, disaster relief, crane operations, pipeline construction, on expeditions, on rescue and recovery missions, and last but not least, in passenger transport – the natural habitat of the U 4023 and U 5023 begins where roads give way to rough tracks and open country. 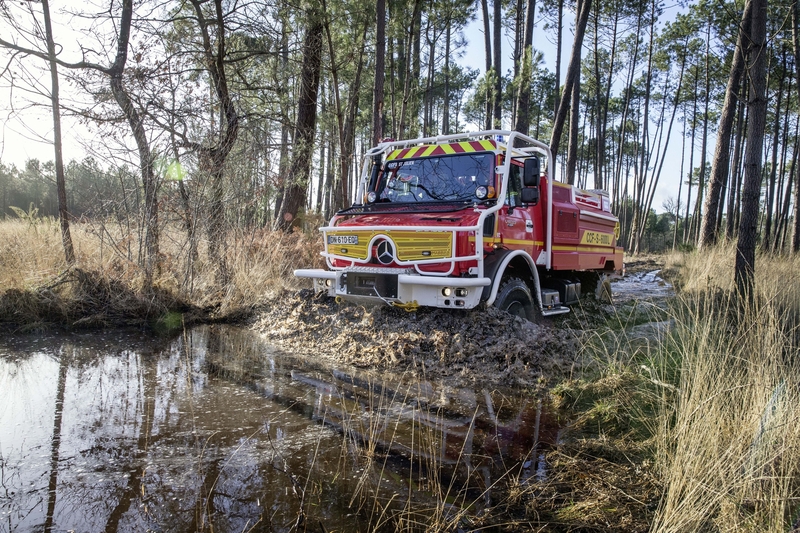 An array of equipment developed by specialist equipment and body manufacturers means that the Unimog can master difficult tasks, even in tough terrain. Despite the challenges posed by the Euro VI norm, the conceptual advantages of the new Unimog extreme off-roader generation have not been hindered, in fact they have been extended even further. 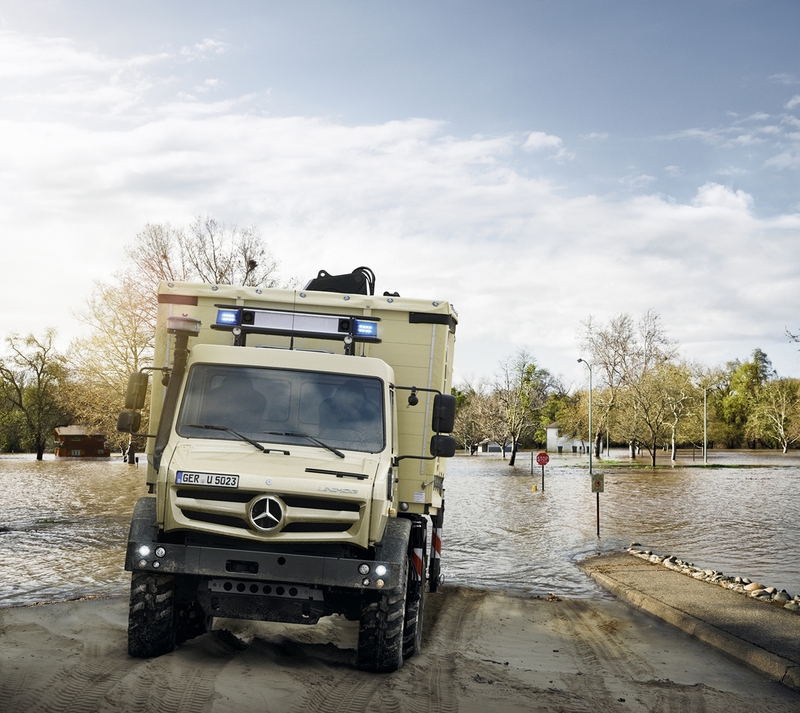 Despite being a unique vehicle concept, the Unimog still benefits from its proximity to the series-production Mercedes-Benz truck models. As a result of concentration and being able to share the production processes at the Wörth plant, the result is highly efficient manufacture, guaranteed high quality and swift access to spare parts. 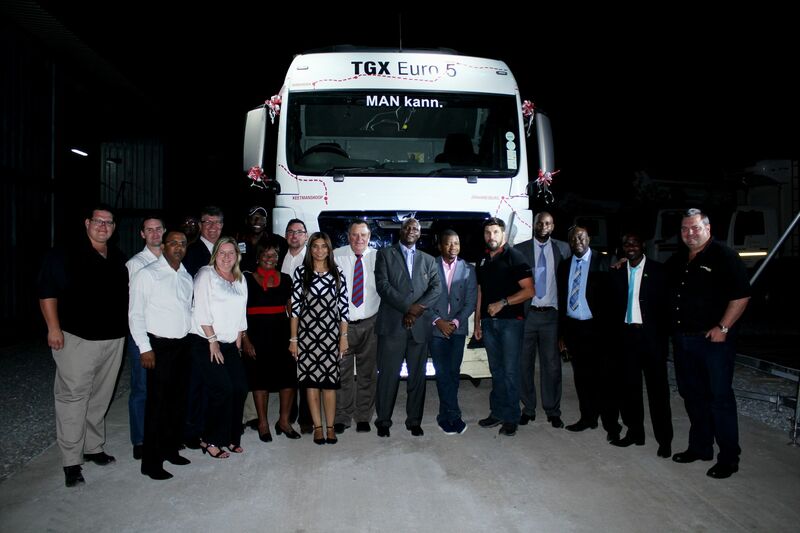 Around the world, 650 service outlets in more than 130 countries stand ready to provide maintenance and repair services. Special financial and other services round off the overall package.